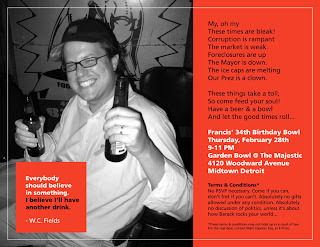 Yesterday was Francis Grunow's 34th birthday, which was celebrated at the historic Garden Bowl on Woodward Ave. It was the densest concentration of young and hip Detroiters since the grand re-opening of the DIA. I swear. I know a hundred or so people in this city and all but 6 of them were there. I learned many things over the course of an evening of drinking, bowling and, well, even more drinking. Variety is reporting that the 80th Annual Academy Awards this past Sunday had the lowest ratings ever. It's an absolute shame. This means that a lot of people not only missed Jon Stewart's top-notch monologue during the show, they also missed Glen Hansard and Marketa Irglova performing "Falling Slowly" from their movie Once. They went on to win an Oscar for their song. However, let's face it, their movie was good enough that they deserved a lot more than just one nomination. Oh, well. Maybe next time around. I long ago (at least in Internet years) discovered that my blog is one of the highest ranked ones when you search for "Dating in your 30s" on Google. As such, when I came across Lori Gottlieb's article in The Atlantic, I felt a need to comment on it. Ms. Gottlieb makes the argument that we'd all be a lot better off if we settled for a less than ideal partner when it comes to love and marriage. I think she makes some interesting points. The problem, of course, is that it could be taken to an almost ridiculous extreme. Simply marrying someone because they're available isn't a good idea, in my opinion. But maybe, just maybe, we could all do better by having one or two less items on our "deal-breaker" lists. 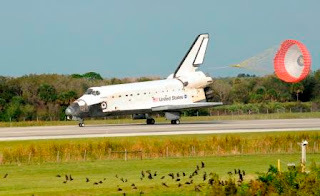 Atlantis made another perfect landing in Florida at 9:07 this morning. This brings their 13-day mission at the International Space Station to a successful conclusion. It also means that astronaut Dan Tani is once again on solid ground after spending 4 months in outer space. Keira Knightley is quoted in a recent interview as saying that the only excerise that she gets when she isn't working when she turns up the radio. You know, I've tried various programs in an effort to shed a few pounds over the years. I think I'll have to try this one: exercising with Keira. Turn the radio up. If nothing else, you have to admit that it has worked splendidly well for her. The WGA Strike Is Over! YEAH!!! It's official. The Writer's Guild strike is over. The scribes got a decent contract and I get my favorite television shows back. Plus, more movie projects will be in the pipeline soon.